As the latest newcomer on the vacation rental resort scene, Solara Resort is trending the limelight as the buzz spreads. "Did you hear? Solara is going to have a wave simulator!" can be heard followed by gasps. "For real? You can flowboard at the resort? Indeed, you will be able to hit the waves at the resort water complex that also includes a zero-entry pool and a children's splash pad. As Disney area resorts compete, you, the visiting guest, is the greatest beneficiary as the standards of luxury & amenities advance. Orlando luxury resorts now boast amenities and tropical beauty most island resorts could only dream to attempt. The greatest envy of all is the backdrop of amazing theme parks such as Disney World, Universal Studios, SeaWorld, Water Parks and so, so, much more. Did you know that any point in Florida is 60 miles or less from a beach? Relax luxury resort style while taking a break from the crowds, thrills & activities that Orlando has to offer. Sleep in, sip your coffee poolside or take a stroll down to the ice-cream parlor for breakfast – why not? The kids won't object. You're not only on vacation to experience fun in the sun, but also to escape from your daily routine and all that stuff your conscience always tells you should or shouldn't do. 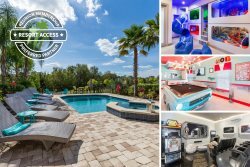 Find a good spot in the sun or enjoy a good book in the shade of a private cabana while the kids work off their energy at the splash pad and water slide. As you close your eyes the gentle breeze will sweep your mind free from clutter and fill your soul with serenity. Not ready to seize the day just yet? That's all right; let the lazy river take you for a carefree excursion under the sweeping palms. Let the Florida Sun warm the droplets on your skin while you run your fingers through the cooling water. Your tube squeaks a little as you dodge that waterfall with a gentle kick from your toes. Another lap? Let your hair air-dry as you take a stroll around the resort lake. Take in the view of the fountain as it generates a misty centerpiece. The surroundings of the resort are meticulously landscaped with vibrant year-round flowers and lush greenery to create an all-immersive feeling of peace and tranquility. If you need to sneak in some work during your visit, the Solara Resort Grand Clubhouse hosts nice indoor & outdoor lounges and workstations. Are you feeling a little guilty about that ice cream cone now? A few "laps" on the Fitness Center treadmill will make you feel better. Finish off a beautiful day at the resort with a mouthwatering dish from the Bar & Grill. Florida evenings are mild and pleasant and known for displaying spectacular sunsets. It's true; you can spend the entire day at the resort and fill it with activities & relaxation, food & drinks, and never run out of things to do. If you're with a group of friends, why not challenge each other in a match at the basketball court, or for a game of volleyball? Have a seat on the benches and watch the kids kick around on the soccer field, or, why not join them? If you are a sports team in town for a tournament you can train at the resort courts & fields. Now that's convenient! Solara Resort is also close to Walt Disney World's ESPN Wide World of Sports where athletes compete live. Perhaps you're one of them? When you venture off the grounds of Solara Resort, the options of things to do, see and eat are so many it can feel dizzying. The greatest "problem" to solve during your visit to Orlando is choosing between one amazing venue over another, and another, and another…you get the idea. We could fill pages by just naming them all. Would you like to splash down into a pool from a towering lava spouting volcano? Kayak amidst bioluminescence? Swim with Dolphins? Solara Resort’s central location offers access to amazing ventures in all directions, within and beyond. Find out more about Solara Resort today!